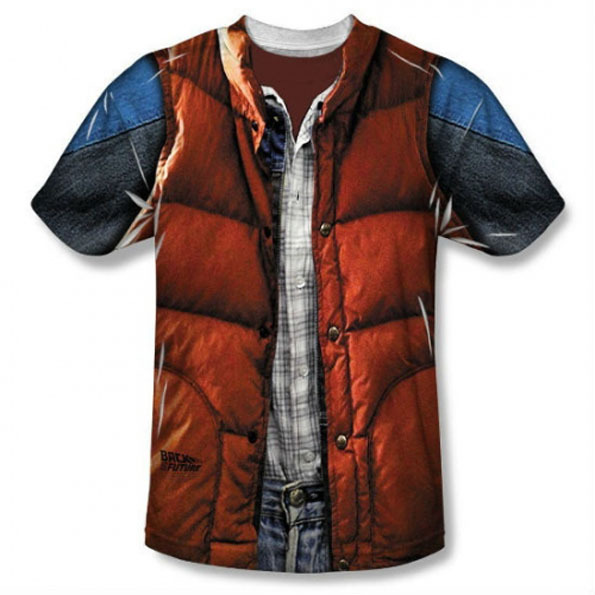 This t-shirt is printed with Marty McFly’s outfit: a denim jacket on top of a plaid button up tucked into jeans, topped off with his signature red puffy vest. Pretty amazing. Heeey you guuuuys should do Sloth next! As cool looking as this get up is, I don’t think anyone could pull it off except Michael J Fox. And that’s because that man is well traveled. Time traveled that is! God, that was dumb. ♫ If I could turn back tiiiime! ♫ Yes I’m singing a Cher song in a Back To The Future post. It’s because I have no decency. No decency at all!